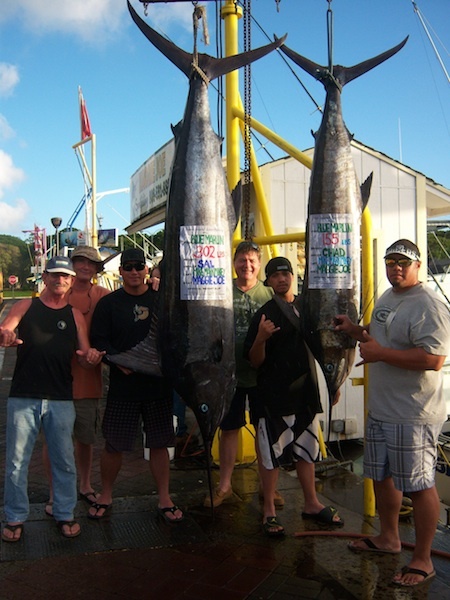 Angler's Sal and Chad with 302 lb and 155 lb Blue Marlin's! 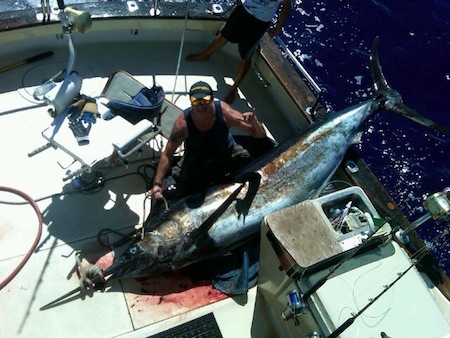 Mahalo to Angler’s Sal and Chad for choosing Maggie Joe Sport Fishing! The group departed Kewalo Basin, next to Waikiki, aboard the Maggie Joe on a sport fishing charter with Captain Mike and Mark. It was a heck of a day out on the water as the guys doubled up with two nice Marlin while deep sea fishing outside of Honolulu, Oahu! Aloha and Hana Hou! The Schofield Chapel Group with Mahi Mahi! Mahalo to the Schofield Chapel Group! The joined us for a day of deep sea fishing outside of Waikiki, Oahu aboard the Maggie Joe and hauled in this Mahi Mahi! Aloha and hopefully we’ll see you folks out on the water again! 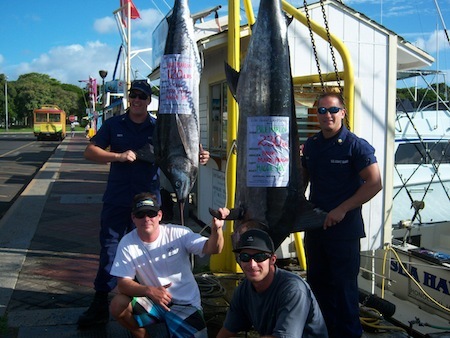 Brook and Shane with Captain Mark, Morgan and 2 great looking Marlin! Mahalo to Brook and Shane for choosing Maggie Joe Sport Fishing! The guys departed Kewalo Basin, next to Waikiki, on a sport fishing charter aboard the Maggie Joe with Captain Mark and Morgan. It was an action packed day out on the water as they hauled in a 120 lb and 230 lb pair of Blue Marlin while deep sea fishing outside of Honolulu, Oahu. Aloha guys and can’t wait to see you on the water again! Angler Rob with 651 lb Blue Marlin! Rob with his 651 lb Blue Marlin on back deck! Rob hauled in this massive 651 lb Blue marlin while deep sea fishing outside of Honolulu, Oahu with Captain Mike aboard the Maggie Joe! The fish bit at about 10:30 am and Rob hauled in the beast in about 39 minutes. Once the fish was at the back deck it took the guys another half hour to pull it out of the water. Congratulations Rob on bringing in the biggest fish in the harbor so far this year. 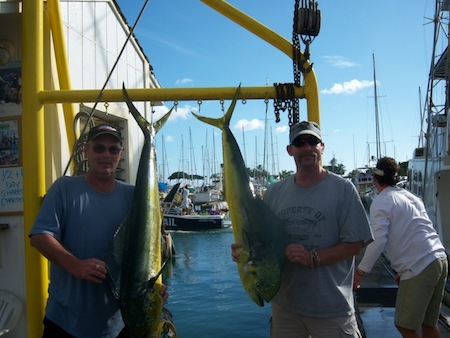 Mahalo for choosing Maggie Joe Sport Fishing and thank you very much for your service! Aloha! 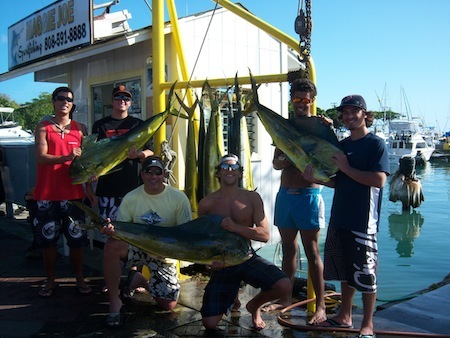 Tony, Nick, Dominic, Malik, Taylor and Kevin with 8 Mahi Mahi! 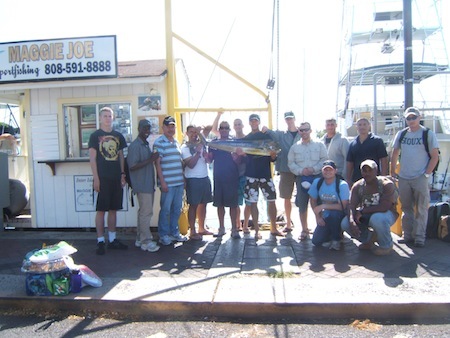 Mahalo to Tony, Nick, Dominic, Malik, Taylor and Kevin for choosing Maggie Joe Sport Fishing! The guys departed Kewalo Basin, next to Waikiki, aboard the Maggie Joe on a full day sport fishing charter with Captain Mike and crew. While deep sea fishing outside of Honolulu, HI Captain Mike ran into a a group of Mahi Mahi and the guys had a blast reeling them in. Aloha! 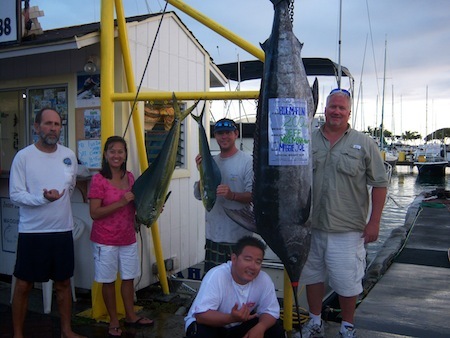 Jeff and Wanda with Captain Mike, Mate Mark and Mikey and 200 lb Blue Marlin! 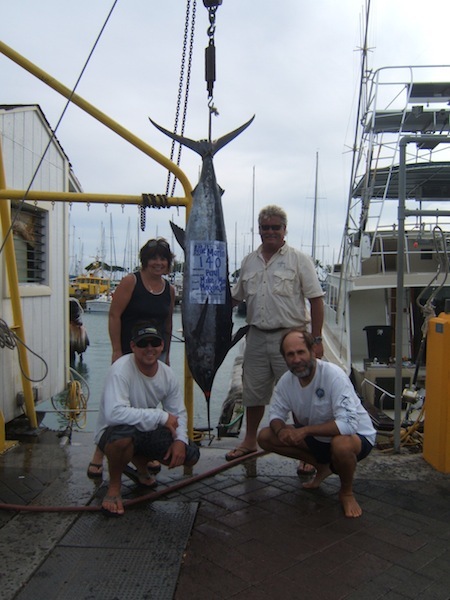 Mahalo to Jeff and Wanda for choosing Maggie Joe Sport Fishing! The couple hauled in 2 Mahi Mahi and a 200 lb Blue Marlin while deep sea fishing outside of Honolulu, Oahu aboard the Maggie Joe! Congratulations! Dixie, Curtis, Paul, Annie and Craig with 5 Mahi Mahi! 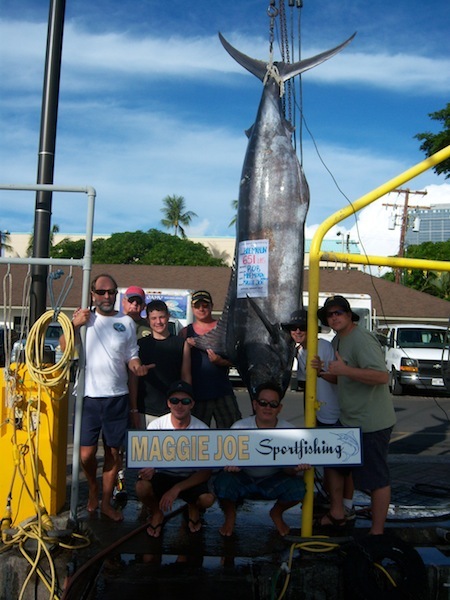 Mahalo to Dixie, Paul, Anne and Craig for choosing Maggie Joe Sport Fishing! 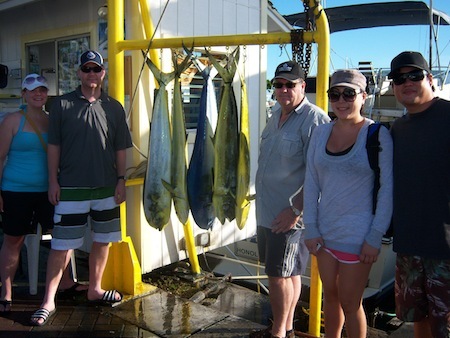 The group hauled in these 5 Mahi Mahi while deep sea fishing outside of Honolulu, Oahu! Great job and enjoy! Ken and Tracy with 2 Mahi Mahi! 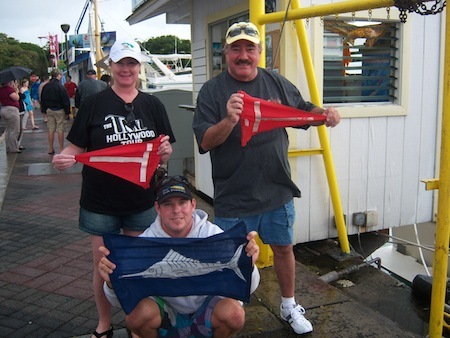 Mahalo to Ken and Tracy for choosing Maggie Joe Sport Fishing! Ken and Tracy joined Captain Mike aboard the Maggie Joe on a full day sport fishing charter. While deep sea fishing outside of Honolulu, Oahu they hauled in these 2 Mahi Mahi! Enjoy!